Small listed companies have performed significantly worse under Labour governments over the past 40 years because of major policy changes, a report says. Funny thing about this article – it’s mostly rubbish. The Labour government in the mid/late 1980s was hardly a traditional left-wing administration as it implemented neo-liberal, free market policies at breakneck speed. It was the government that gave us the term “Rogernomics“. In essence, it was a Labour government in name only, having been hijacked by future-ACT MPs and neo-liberal cadres. It was a foretaste of how Brash seized power in 2011 after a putsch overthrew Rodney Hide as ACT’s leader. The main reasons for poor performance in small firms during Labour governments included market under-performance, periods of falling inflation, harsh default-risk and credit conditions and the introduction of deregulation in 1984 that opened up firms to increased foreign competition and exchange rate pressures. Notable features were the two Labour governments of the 1980s under Prime Minister David Lange. In the first term from 1984 to 1987 the mean returns were amongst the highest in the sample but in the second term the smaller firms had a mean monthly return of minus 7.2 per cent. “…in the second term the smaller firms had a mean monthly return of minus 7.2 per cent”. Eight credit down-grades under two Right-wing governments. Eight years, four credit upgrades. It seems farcical in the extreme that two academics – with the willing assistance of an uncritical journalist – have presented “research” which brands the Labour Party as “bad for small business” when the 1984-89 Lange-led administration was an undemocratic aberration that was closer to the ACT Party than the Kirk or Clark governments. In essence, Malone and Anderson have passed judgement on governments implementing right wing, neo-liberal economic policies and, rather unsurprisingly, given them a *fail* mark. 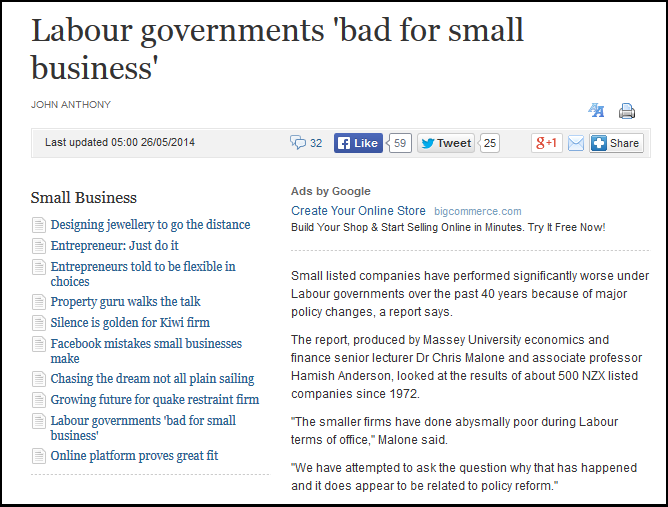 But you wouldn’t think it with the headline “Labour governments ‘bad for small business’” and the statement that “smaller firms have done abysmally poor during Labour terms of office”. But at least this has given right-wing bloggers some joy – even if those same bloggers have been less than honest at what Malone and Anderson have actually written. But that’s the right wing for you; never let inconvenient truths get in the way of a good propaganda moment. 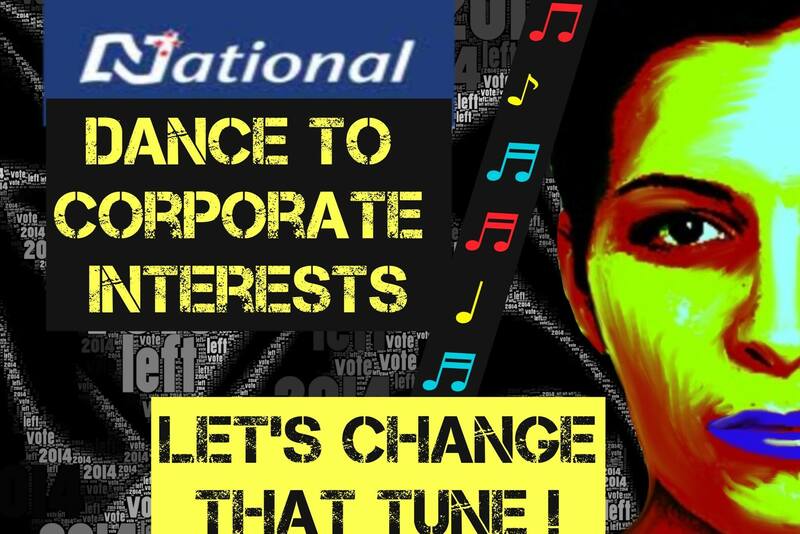 National Party: What about the workers? 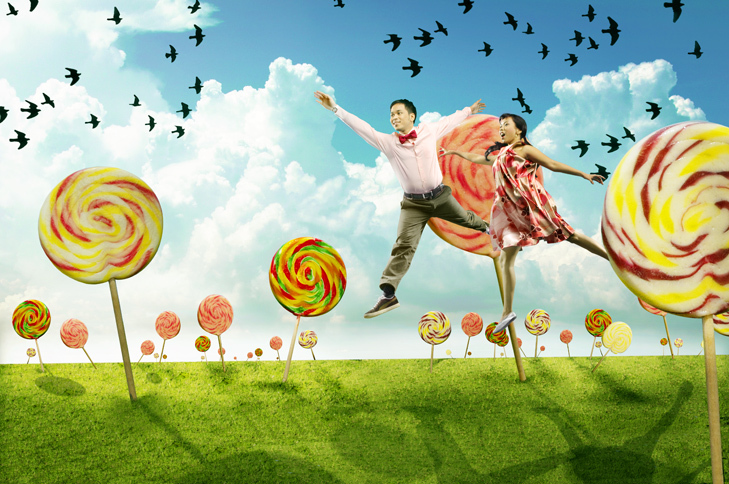 This blogpost was first published on The Daily Blog on 30 May 2014. The irony of this billboard is that it is not a parody. It’s a real billboard spotted on someone’s front lawn. Obviously this particular hoarding-facing was designed before news that government borrowings have increased from $16.7 billion to June this year, to $18.4 billion to October this year. Or that interest rates will most likely rise, due to credit downgrades by Fitch and Standard & Poors. 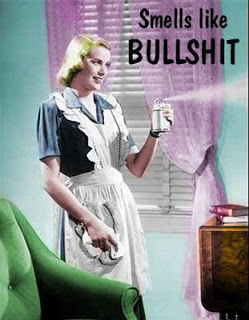 And with an imminent announcement Moody’s – also likely to be a down-grade – expect your mortgage repayments to rise soon. I suspect these particular billboards may come down very shortly. The embarresment factor may be somewhat irritating for the encumbent government. Thanks to ‘Sandman’ for sharing this image with us. It’s official – National is a poor manager of the Economy. 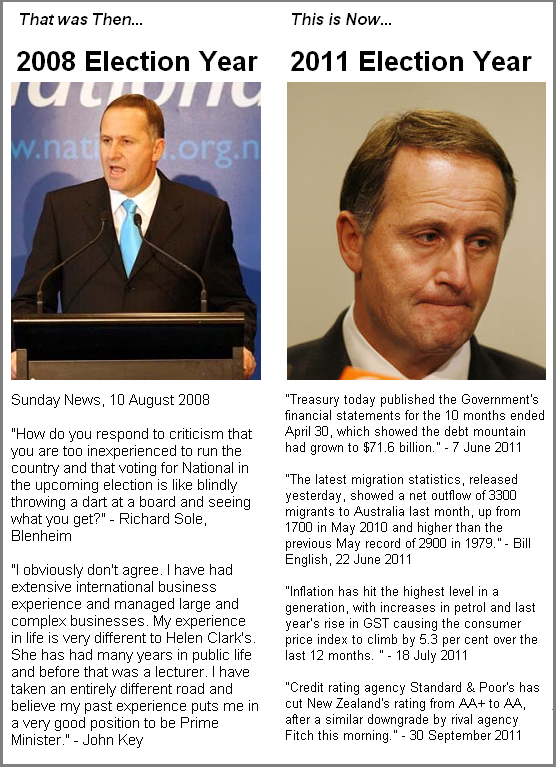 It’s official – National (and Labour under Rogernomics) was, and remains, a poor manager of the economy. Treasury and international credit agencies back this up with their data. Firstly, Treasury data of recent New Zealand history reaching back to Rob Muldoon’s administration show that credit agencies inevitably downgrade our sovereign credit rating whenever National is in office. The only exception to this is when Labour was in power – during it’s Rogernomics era. The money that government borrows (sovereign debt) or that bank’s borrow (private sector debt) is all taken into consideration by overseas lenders. 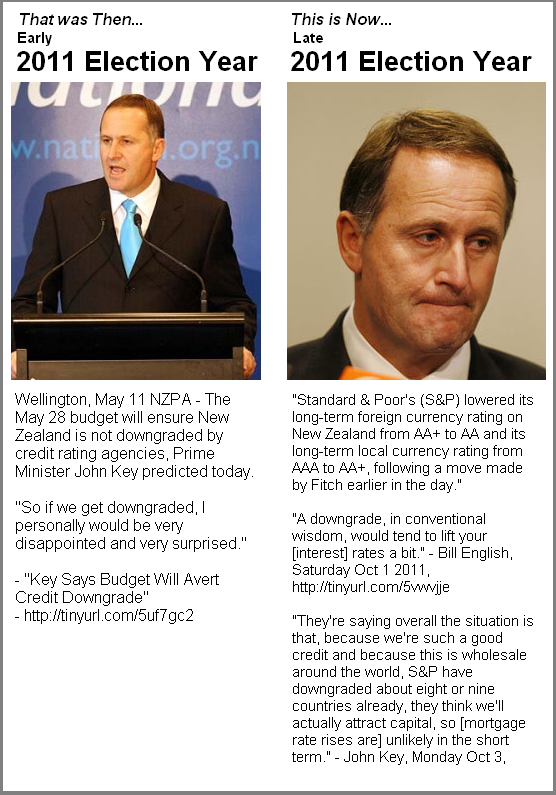 “Our primary focus for this Budget is to avoid a credit rating downgrade because we think that would add about 1.5% to mortgages for New Zealand homeowners.” – John Key, May 2009. Source. “If a downgrade were to happen, it would add 1-2% of interest on the amount the government borrows, which is around $600 million each year. This is to be avoided at all costs.That’s every homeowner, every business, everybody paying 2% more. That would be irresponsible in my view for the government not to act. ” – John Key, May 2009. Source. “The No. 1 way to see New Zealanders down the road from their jobs is if their businesses cannot be funded. That is what happens when we have a credit downgrade, and that is what we would have had under a Labour Government.” – John Key, June 2009. Source. “There is no doubt that a credit downgrade would generally lead to somewhat higher interest rates.” – Bill English, March 2011. Source. “If I just look at our debt track and I compare that to the OECD debt track for other countries for 2012/2013 year, we have got a substantially lower debt exposure than most other countries.” – John Key, May 2009. Source. Instead, Mr Key says an increase in private sector debt when Labour was government has helped contribute to the downgrade. ” – John Key, 4 October 2011. So in 2009 we “have got a substantially lower debt exposure than most other countries” – but only two years later we have “an increase in private sector debt when Labour was government “. It seems that Mr Key is confused about our debt levels? As for refusing to take responsibility for our credit down-grade – we might overlook that once. But how many times has New Zealand been downgraded when National was in office? 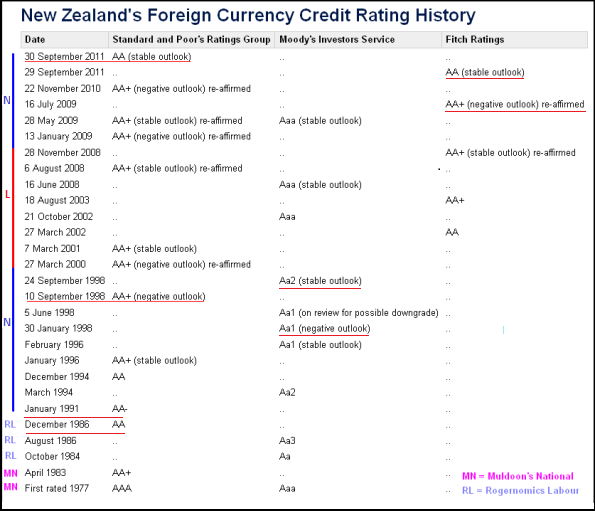 New Zealand's foreign currency credit rating history - National's track record in downgrades. Standard & Poors have downgraded New Zealand’s credit rating three times during National governments; 1991, 1998, and this year. Moody’s downgraded NZ in 1998 (National government). Fitch, once, five days ago. As an aside, both Moody’s and Standard & Poors downgraded NZ during the neo-liberal reforms of Roger Douglas, in the mid-late 1980s. It seems that credit agencies view neo-liberal economic policies as risky. By contrast, Labour’s tenure of government was positively rated or upgraded by the three agencies. 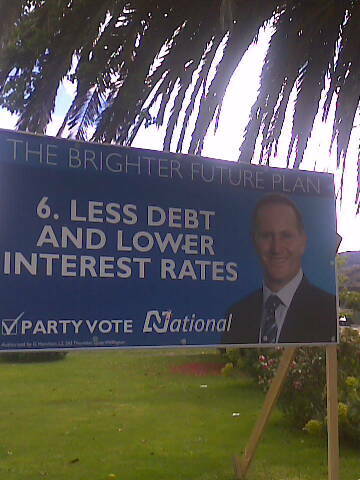 All this makes a mockery of National’s claims as being a “prudent fiscal manager” of the country’s economy. They are nothing of the sort. 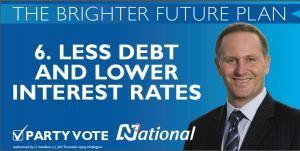 The verdict of credit agencies is clear: National is a poor manager of the economy. This, of course, many of us new already. There is a high degree of irony in this whole affair. 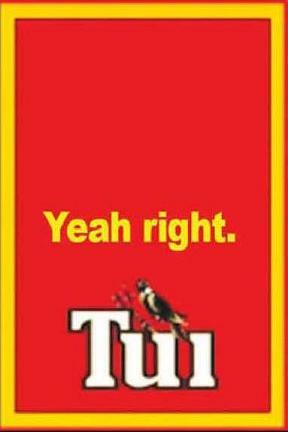 National clearly refuses to accept any degree of responsibility for New Zealand’s credit downgrade. Yet, they are the government. They are the ones in charge. They pass laws and make policies that affect every single New Zealander. “”But it is also true that anyone on a benefit actually has a lifestyle choice. If one budgets properly, one can pay one’s bills. So welfare recipients are expected to be responsible for their actions. But National Governments are not. Is that how things work in John Key Land?